I’ve done some work previously in XSLT to nicely format XML output within a browser. Presently, some code I’m working with also does this transforming of an XML output via XSLT into a HTML file. I wanted to modify the XSLT, but found I’d made an error, so without having to pre-configure data and run the process every time every time in a more timeconsuming iterative debugging approach, I was able to do the following manually. Having an XML file called example.xml and an XSLT file called example.xslt, by adding the second line below manually to the XML file I was able to then render the XML file in a Browser, which then reported the error enabling me to easily correct. It would have been nice if the browser could accept this for the XML file without the need to manually modify it. There probably is a better way, or a more specify XML GUI tool, but the time to find this out, maybe next time. Here is a Beginner XSLT reference. While in Singapore earlier in the Year (Yes, I’m very slack with these photos), I got up close and personal with the new Airbus A380. I wasn’t that lucky to get inside, I think that was reserved for airline flight crews, but still there are a few photos. I’ve had some media problems with both DVD’s containing photos of my Singapore/Thailand/Malaysia trip, but you can view a few Here on my Flickr. 7 Nov 2006 Airbus recently announced it’s third major delay, and today FedEx cancelled it’s order. Read more amount the details, and airline orders at Wikipedia. Flickr. Moving on from Web 2.0. On the features of Web 2.0 sites is the design pattern concept of The Perpetual Beta (See Point 6). Seems Flickr or more likely Yahoo (the owner of Flickr) wants to be more. Have a close look at the logo. I’ve heard of people that go plane spotting. Watching different planes that come into airports. So for all those plane spotters. What is it? My guess would be an Boeing 737, probably a 737-800. Speaking of Plane Spotting, I’ve been meaning of putting up my photos of the recent Asian Air Show in Singapore and my up close and personal photos of the Airbus A380. Arrrrrgggggggggggghhhhhhhhhhhhhhhh! I’ve tried to retrieve my photos from DVD and I’m getting an cp: reading `/media/photos2006/photos/2006/2006_02_23_AirShow/IMG_5939.JPG': Input/output error Error. Well so much for those photos of Singapore, Bangkok and Malaysia from earlier in the year. That’s gotta ruin your Sunday. PS: How did I know what plane it was. Hint: the color gives it away. PPS: Updated Jan 12 2007. Interesting that the present live view no longer has the plane. My Offline View has it. Good to know that this little area of Brisbane has been updated on Google Maps. I guess much like the Slashdot effect, the Digg effect is both a good thing for your exposure and traffic hits, and a bad thing for those ISP’s watching the traffic. (See Jay’s Slashdot Fame). In the past week, I’ve gone to a number of digg article sites and they have been unavailable. I never kept details of these IT articles, but here is one the one article not of an IT I look at that I did. It referred to an image, which the host provider adjusted (see image to the right). The host provider was ImageShack. I didn’t read anything in the T & C about being too popular! Here’s the original Digg Post Gmail ads get a little too personal. PLUTO supporters from all over the world are burning things after the tiny cold planet was booted out of the solar system. The disney company announced it would rename its famous cartoon dog. Trivia questions, already at calamity points, will need to be rewritten and planetariums are busy papering over their Pluto exhibits, retraining guides and cutting the ends off posters. Following my User Group Presentation I was asked by fellow MySQLer Kim about Logical Data Modelling (LDM), in relation to Physical Data Modelling. Well, first the brain had to work overtime to remember when was the last time I worked on a Logical Data Model. The answer to that is 1996 doing R&D work for Oracle Corporation with their CASE repository tool, Oracle Designer, about version 1.3/1.3.2. I’ve learnt in the past 10 years to purge technical stuff from my brain, leading from the capacity in be able to remember in detail data models, data migration and data cleansing issues of projects even after leaving them 3 years eariler. As Kim pointed out, he thinks physically, actually directly at the SQL level, then working backwards to produce an appropiate physical model. To think logically is to consider the entities and attributes and relations before considering the physical tables, columns and relationships. So how do you program somebody to think logically? In the case with Kim, he is undertaking formal studies after already grasping the concepts of software development. Generally today more people don’t undertake the formal education and we end up with The Hobbist and the Professional Syndrome. I guess in summary I’d argue why bother. Does anybody still do traditional logical models? Feedback/comments are welcome. (Professionally I believe there is a place for LDM). However for the purpose of the exercise lets start with a Physical Representation and present a Logical Representation of that to see the differences. From this you can see a classic Library example, showing a table of Books and a Table of Authors, and an intersection table (3NF) to indicate that a Book can have one to many Authors, and likewise an Author can have one to many Books. So how would this have been represented in a Logical Model. Some things to consider in Logical Modelling. Attributes really only require a name, and perhaps just a datatype using number, string, date (Jim Starkey would be happy), but nothing specific like SMALLINT, or VARCHAR(50). I’m going from memory here, so there is probably more points to consider. So how do you teach this when you are trying to work backwards, when I learnt this back in 1988 (some 18 years ago), I’d never created a database or used SQL so I didn’t have the history. Arjen had a brilliant idea to consider Logical Modelling after the fact. Views. Consider an end user requirement for Reporting, and how you would represent your model better to an end user (effectively de-normalising these views so users don’t have to know about joins). In this case you would create a view of Books and a View of Authors. Details such as mandatory/optional isn’t important to the end user report (ie, it’s not like it’s needed to be enforced), and specific datatype details again are not that important. The basics to know how to format a number or a date works. An interesting approach that worked well in our explaining. So it was interesting to go back to the text book using C.J. Date’s An Introduction to Database Systems to review definitions. Also for example Third Normal Form we get from Section 12.3 First, Second and Third Normal Forms. A nonkey attribute is any attribute that does not participate in the primary key of the relvar concerned. Two or more attributes are mutually independent if none of them is functionally dependent on any combination of the others. Such independence implies that each attributes can be updated independently of the rest. Man, no wonder many years of experience and having generally seen most cases, enables me to forget this and not feel like I’ve fogotten something. I first coined this term in February 2006 in a paper titled “Overcoming the Challenges of Establishing Service and Support Channels” for the conference “Implementing Open Source for Optimal Business Performance” View Paper. Here are the bullet points from the slide in a presentation. Slow Queries aren't always that bad! Well, now I have your attention, Slow Queries are bad (unless it’s a single user system and you don’t care). However there are worse things then slow queries in a large enterprise system. I’ve been asked in recent weeks a number of questions which has brought this topic to discussion, as well as a current implementation I’m undertaking for a client of a purchased product. High volume repetitive queries can have a worse effect on your system’s performance. Combined with slow queries that take locks, these queries can have an extreme effect on performance and if you don’t know your application, or have the right tools, it can be initially hard to diagonise easily. This problem is the classic Wasting CPU cycles problem, seen it before, will see it again. Here’s a classic example for reference. Using the current product that I’m customising and installing (I’ve not be involved in any development), a typical Customer Information System (CIS). The system when deployed will have 1.1 Million Customers. Each Customer has a Balance. Now the Customer Balance is not recorded against the customer record, it’s calculated every time it’s required. So, no big deal, well yes. The stored procedure to calculate the balance hit’s 4 different tables, and one of these tables is one of the largest in the system (recording all detailed financial transactions). Multiple batch reports alone that work with large sets of customers all require or use the current balance in some means. There are only a small set of transactions that affect the balance including Invoice Statements, Payments, Adjustments, Credit Control, Write-Offs . These processes by there own nature are either batch or small online transactions. The calculation of the balance can be applied against the Chunk of customers in a batch, or individual Row for online transactions (See The RAT and the CAT). Even for the paranoid, the re-calculation of the customer balance for all customers in batch is more efficient after hours, yet only customers where some transaction that has been applied since the last time the re-calculation ran is necessary. MySQL doesn’t be default have any analysis tools to identify and manage these types of queries. Peter Zaitsev in his article Slow Query Log analyzes tools highlights the issue with a good approach by a source code change to long_query_time as well as some additional scripts. Hopefully MySQL will consider a more improved approach in future releases that doesn’t require patching the source code. Now it’s unlikely that MySQL will do another SHOW STATUS Gotcha and for example change the unit of measure from seconds to milliseconds, but they could make it a float, so you could specify 0.1 for example. 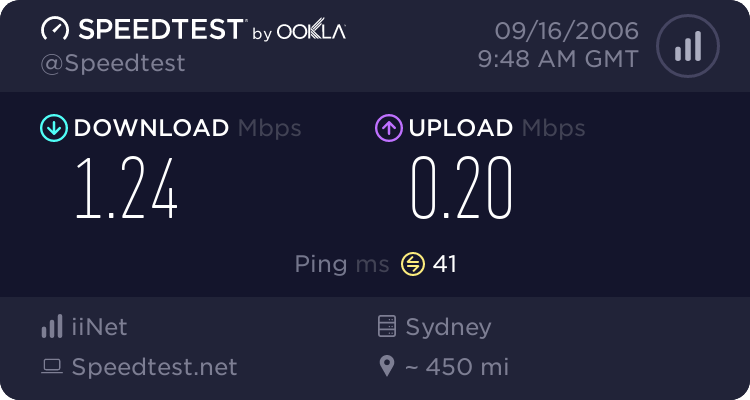 Want to know your Internet Connection speed in a real world test? Want a fancy graphical presentation of your internet Speed? 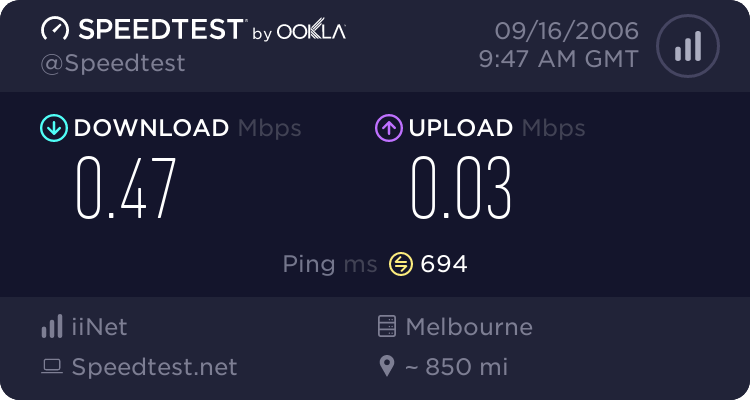 SpeedTest.Net has you covered. As you can see that even provide graphics results to can use on your own site. So just how much does my Bittorrent download of Stargate and StarGate Atlantis weekly epsiodes affect my link (Azureus states about 20kB/s down and 20kB/s up. Here is the results. Hmmm, seems if affects my link much more then it really states! I’ve learnt a lot of non IT street smarts in this time. The first startup took the VC route, and after 3 rounds while I wasn’t involved in the process you pick up things. The single biggest tip here is the Bell-Mason Diagnostic. Here a few introduction references worthy of a quick review (One, Two). When you take any great idea, and then consider the 4 quadrants and 12 axis you realise you really need to make larger circles of professional contacts. Valley Boys Digg.com’s Kevin Rose leads a new brat pack of young entrepreneurs. This is the new wave of success that works without VC. For me this recent post on the Meebo Blog really impressed me. Nineteen releases, eleven (fantastic) team members, and 295,321 gummy bears later we see over a million users log into meebo each day. As a coder, all you hope is that your service will be able help people go about their day-to-day lives. Stability, bugs, and good usability are always top of mind. 1,000,000 users of your Web 2.0 application. This impresses and motivates me. What makes it possible to anybody, is you can get a LAMP stack, a live-cd, cheap hosting and you can turn your idea into something real for next to no cost. Of course, I won’t start on the nightmares out there of great ideas that are very poorly designed. At least the underlying stack can support anything you want to achieve, and MySQL is behind these success stories. One more thing on Meebo, Check out the meebo map!. I’ve been told that Google has something of a similar nature at the Googleplex. Well I can say I’m very keen to see this, and will be 8 weeks time when the First MySQL Camp is held. Sheeri talked a little about MySQL Triggers in One TRIGGER Fact, Optimizer Rewriting Stuff. While it’s great that MySQL 5.0 has Triggers, there are some things that I feel could become features in future releases. One of the beautiful features that MySQL has is IF EXISTS. This ternary operation that if the object exists performs the operation, of not it does nothing works wonders in reviewing logs for errors. One of the problems with Oracle for example, is the requirement to ignore the ORA errors for non-existent objects. But this functionality doesn’t exist for Triggers? One must wonder why. I’d like to see this. In this case, this functionality effectively eliminates the need for a DROP IF EXISTS, however I’d not like to see this introduced into MySQL especially it’s an Oracle specific syntax and not ANSI SQL. MySQL only allows one Trigger per type per table. That is, there can only be one BEFORE UPDATE for example. While you may ask the question why you would need this functionality. Here is a typical situation. You use Triggers to perform some level of business functionality, determining values for optimised (denormalised) columns is a good example. So you need to write an appropiate trigger for that piece of functionality. You also use Triggers to perform database auditing, that is for every insert/update/delete of data, you record a full copy of the change in an audit database. One way to ensure this is consistent across the entire database is to implement via triggers. So you leverage programming functionality to pre-create triggers for all tables to manage this. The problem with MySQL occurs in that you have to now merge these triggers for tables that require both. If you want to deploy your application into a test environment, you may wish to not deploy your auditing triggers, but now you have this functionality mixed in with business logic. In this example, with MySQL you would need to create three seperate triggers. The Windoze CLI, or lack there of. There are many reasons why I hate Windoze, here is just another example. I need via the command line, change to a given directory, so I can manually run a command. Not only can I not do a cd to the directory, as shown in the printscreen here, I can’t use a wildcard to try and identify the directory better (perhaps its the addition of uppercase characters or a fullstop at the end of the directory that’s making this OS confused?). Of course I can’t do tab completion either. Ok, well, just cut and paste what the dir gives you. No, it’s not highlight, right mouse click, Hmmm you have to go, Menu | Edit | Mark, then highlight the text, then Menu | Edit | Copy, then Menu |Edit |Paste just to get a copy of the text, and that still doesn’t work. Of course Windoze was never designed for programmers, especially those that can achieve far more with a command line interface (CLI for all those Windoze users that have never heard of it), and much more quickly then with having to move a mouse around, drawing one hand away from the keyboard where you do all the other typing. So much for making the world more efficient. So how to you actually do it, well the only way I know is you have to install more software from XP Power Toys called Open Command Window Here. This allows you to use the GUI Windows Explorer (again a mouse thing) to navigate to the directory, then right click to open a command window at this directory. So what was the outcome of the actually directory using this comment, see below. The same name I was trying to type in. Go Figure!!!!!!!!!! Last night we had a number of keen souls at the Brisbane MySQL User Group. I was very impressed to see the majority of people with laptops at hand. You can download my slides and code examples at my Articles page. In our hands on Hackfest tutorial we created the new command SHOW USERGROUPS. Before anybody makes a comment, it was stated in the presentation that this command was made a dummy one, and is a poor candidate for two reasons. Still it was productive, here was the outcome of our work for the evening. I’ll be publishing more beginner tutorials in my MySQL Compiling Category over time. Update Check out http://www.arabx.com.au/hackfest.diff.htm for a diff of files to produce this output. Continuing on from Tutorial 2. When reviewing the 2.1. C/C++ Coding Guidelines for MySQL, you will see that the MySQL Source uses within the C/C++ code DBUG (Fred Fish’s debug library). This is one of the 3rd party open source products that are documented in the Internals 1.4. The Open-source Directories. You will also find some usage in the MySQL Manual E.3 The DBUG Package. So enough talk, how do you use this. This will make a lot more sense with my upcoming presentation where you will see clear use and interaction between source files such as sql_parse.cc & sql_show.cc. I was given a perl program today, however running on my Fedora Core 5 install gave me the following error. A quick check of the things I know about Perl. 'glob' trapped by operation mask at (eval 25) line 1. Time to IM my friend and Perl expert Tony. I can obviously read Perl ok, have even worked with Perl CGI many many years ago, but this will be some configuration syntax I’m just not familar with because I don’t develop in Perl. And indeed it was the syntax. Now some enterprising perl person could rather then just saying Can’t locate Term/ReadKey.pm , could add try cpan Term::ReadKey to install this package.